I'm back with card # 3 for the Lily Pad Cards Bling Challenge. If you would like to see the other two cards, please check out my previous two posts. 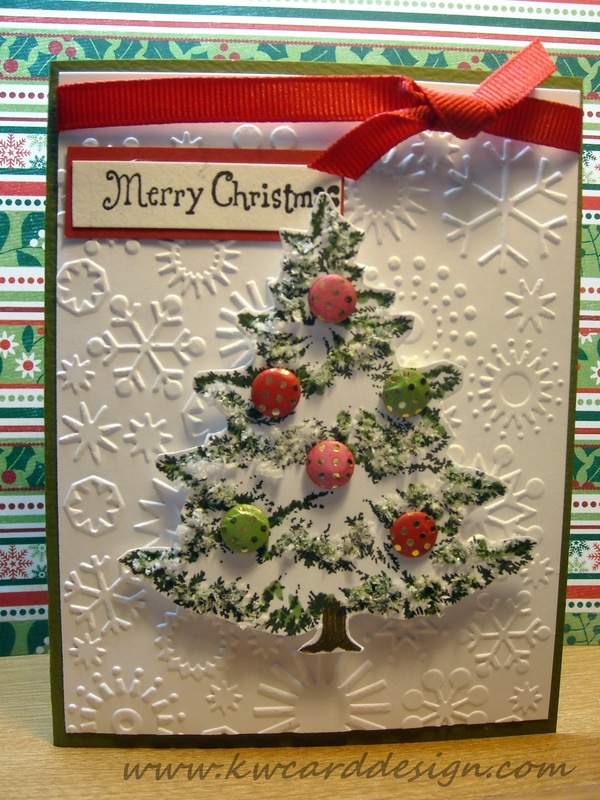 The final card is a simple Christmas tree. It features some Flower Soft, and "Candi". I love this stuff - especially if you have to mail a card out and want to add the look of a brad to your project - these are lighter, and less bulky. 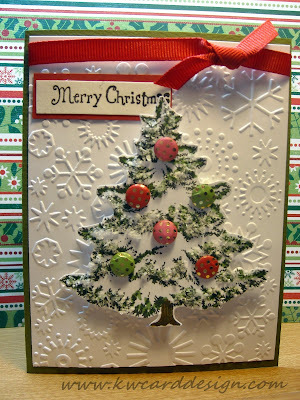 Back with my second card - the "bling" for this card is represented in the paper which is called Shimmerz Sheets, and the beautiful mosaic tiles. The embossing just sets off this beautiful paper. This card wold be one that would be easy to mass produce for sure!! OK!! Onto my third and final submission for this challenge. Happy Sunday!! I am submitting some cards for the current monthly challenge over at Lily Pad Cards. It is all about Bling, and who doesn't like bling!? This is card # 1. Check out my back to back posts for the other cards. 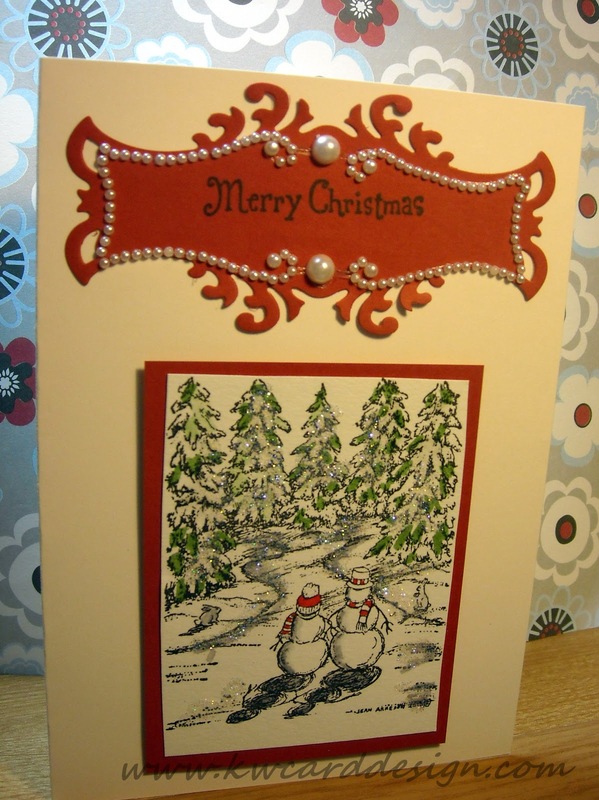 We all know that the Holidays are just around the corner - so why not get started on the card making right!! Onto the next card submissions!! Happy Sat crafters. It is a rainy Saturday here in Missouri, but we need the rain. 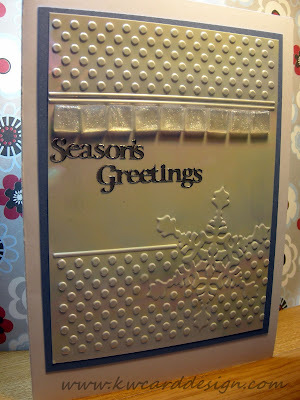 What a better time than to share another card with my readers. 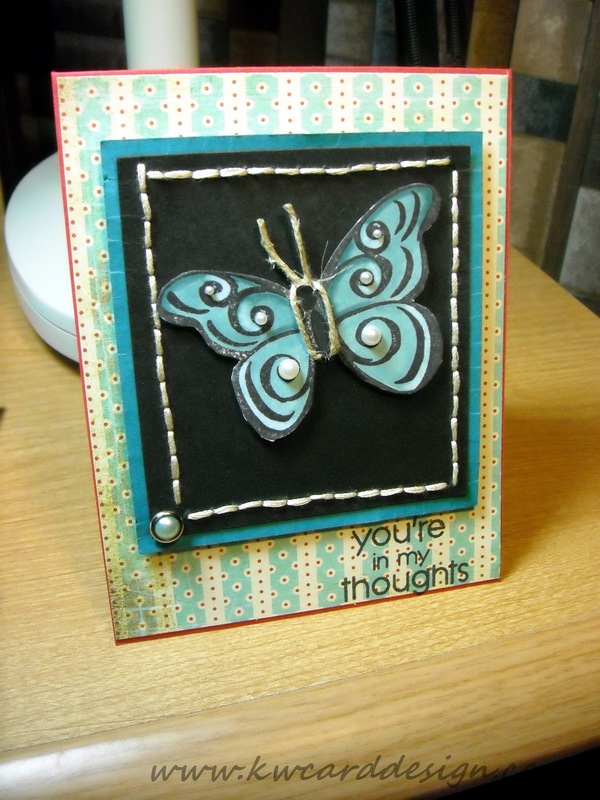 Today's card features some hand stitched sewing that I have tried for the first time on my cards. It turned out pretty good. I had help with my new tool - the We R Memory Keepers Sew Easy tool. It is actually a little card to use than I thought - and maybe for that reason is because I tried to pierce through two sheets of cardstock, I am not sure, but nonetheless I made it work, and it didn't turn out too badly in my opinion. I made this for a friend who has been going through a lot of rough times lately in her life, and with her family. I just wanted to show her that I care! Hi all! I'm back in on this day that America remembers 10 yrs. ago, the terror we faced as a nation on 9-11-01. Most everyone remembers exactly what they were doing, and where they were when they heard about the Twin Towers, and the events that took place after. We are a strong nation! I am proud to be an American, and so happy that we have come a long way since that day!! Let us not forget!! Onto crafty news: I know I keep apologizing for my absence from my blog, but I like a lot of us, things in everyday life take over, and it hardly leaves any time to things we really love. Sometimes you have to MAKE the time. That is what I am doing today. In between laundry and resting up for the next work week, I have made a card to share. I have actually made three cards now this weekend, so things are good!! I used the new BG/Hero Arts background stamp that coordinates with the Out of Print collection, and embossed it in black embossing powder. Then I just picked out random Distress Ink colors that struck my eye, and inked my cardstock. I placed this onto a A2 size card base using some card stock from Gina K. Designs. I added black satin ribbon, and a dimensional sticker. 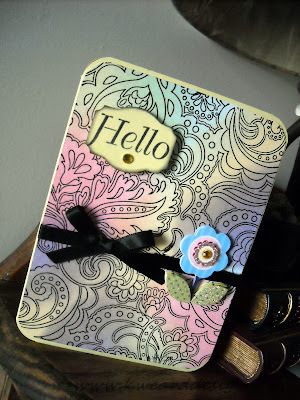 My sentiment comes from TPC Studio called Card Crafting Hello. I would love to hear feedback!!! I love getting comments!! Hi all - I wanted to share with all of my readers that I am selling a couple of craft items that I no longer need or use. I have a retired set of the "Bold Brights" ink pads from Stampin' Up! that I no longer use. I bought them from someone else when I started stamping 2 yrs ago, and I have built up my ink supply with others that I like, and have similar colors, and wanted these to go to a good home. They are all in good condition. I also have the "First Edition" Cricut for sale. I do not use this machine, and it is in very good condition. I am selling it at a AWESOME price! Anyone interested, please email me at : kikiwebster30@gmail.com. I will discuss prices ( which are a steal) in email. **UP FOR SALE** a couple of craft items!